Did you know? January is International Creativity Month! I can’t believe we’re in the middle of January already, so I’m a bit late to the party, but I’d like to remind you all that the first month of each year is International Creativity Month. Take some time in January to feed your creative self—to unleash the power of creativity that you have inside you, just waiting to be nurtured. “But I’m not creative,” you say? That’s a big fat lie. A lie I bought into for far too long. I am not a crafty person; I don’t particularly enjoy making things with my hands, and I’m surrounded by knitters, quilters, and bona fide artists who actually sell paintings. For years I bought into the lie that I’m just not a creative person. But I was wrong, and last year, I finally realized just how wrong. Creativity comes in many forms, and you are far more creative than you think. Last year, I finally stopped to take stock of all the things I enjoy doing. I love acting. And although I’m acting someone else’s script, there is a form of creativity to bringing those characters to life. I enjoy singing, and I even make up some of my own lyrics to entertain my kids. I love to read stories to my kids, and I put on voices for each of the characters. I think up those voices all on my own, and my kids love my antics during story time. I’m a writer, for goodness’ sake, and although I don’t write fiction (yet! ), there’s definitely creativity involved in taking fragments of interviews and turning them into an informative story worth reading. I’m sure that even if you do none of the things mentioned above, you’re still a creative person. We all are; we just use our creativity in different ways. Even the most analytical of professions requires some creativity to get certain tasks completed, and creativity comes into play in so many areas of life. 1. I’m continuing my Day Book journey. I truly enjoyed journalling and doodling in my Day Book last year, so I’m continuing to do that in 2018. I went to Chapters and bought 3 of the journals I enjoy using, because I’ll go through at least that many this year. Between journalling, planning, and doodling, those pages get filled pretty quickly. Sometimes the kids and I take a day to do artsy things. We forget about the books and just enjoy creating together. My daughter loves these days, and the memories we create along the way are far more valuable than a check mark on a curriculum list. This past year, I discovered the one activity that our entire family loves doing: playing board and tabletop games. So I’m taking that love and turning it into a creative pursuit: I’m gamifying as many lessons as I can for my second grader. For example, we’ll be playing Pizza! (a game I’m still developing) to learn and review fractions. More on this in another post; stay tuned! Every year I promise myself, “this is the year I’ll send birthday cards to everyone.” And every year, I fail miserably at doing so. But this past December, this wonderfully giving lady freecycled a humongous set of beautiful stamps and card-making material. And I was in heaven. Now I have some beautiful things to use to make birthday cards, so I’m much more likely to actually send them (since I’ve done all the work of creating the cards in the first place). 5. I joined a supportive creative community on Facebook. I can’t even remember how I found this group, but I found some lovely creative people on Facebook. The group is called “Creativity is Contagious: make and share something everyday challenge,” and joining it was probably the best thing I’ve done to keep my creative juices flowing this year. The simple act of joining this challenge pushes me to at the very least do a quick little doodle and post it in the group every day. The neat thing is that everyone in there is so encouraging, “liking” your posts and making nice comments about your art and creativity, that it makes you want to create more. And I love that the creator of the group is super open about her definition of creativity. I can share my blog posts, videos, or anything else I’ve created or made myself. I’ll be in my third community theatre production this year. I’m so very excited to hit the stage again. Although I much prefer the screen, being on stage is great fun as well. One day I hope to pursue acting more seriously (and professionally), but for now, these community theatre plays give me both experience, as well as an outlet for my creativity (and some alone Mama time). My first play was an adaptation of The Princess Bride (one of my favourite novels of all time), my second play was an adaptation of Sleeping Beauty, and the next one will be an adaptation of The Little Mermaid. I can’t wait! So there you have it; these are some ways that I’m keeping my life open to creative pursuits, not just during International Creativity Month, but throughout 2018. How about you? 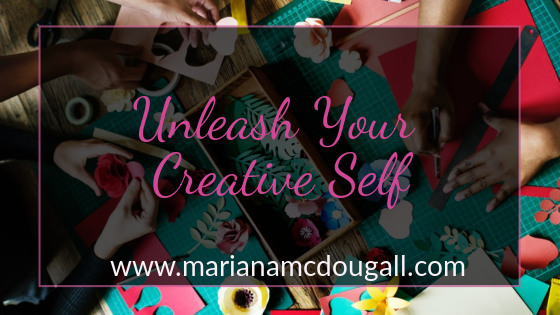 How will you unleash your creative self this year? Let me know in the comments!